I love crossover Christian fiction. It gives everyone, even those who normally wouldn’t read a Christian novel, the chance to enjoy the genre without feeling that they are being preached to. Prophet is a fantastic example of really good crossover Christian fiction. This book easily appeals to YA readers, fantasy lovers and anyone who likes action and supernatural elements in their books. In a vision, 17-year-old Ela Roeh sees the city of Ytar being attacked and burned to the ground by the rivaling city-state, Istgard. Ela hears the voice of the Infinite choosing her to be his prophet and go to Istgard, tell them to turn from their evil ways and free the women and children they look captive in Ytar. Even though she is afraid, Ela accepts this enormous and daunting task, one that changes her life in ways she could never imagine. The world building in Prophet is awesome. Larson makes it easy to envision impressive ancient cities, bloody battle scenes and ferocious wild animals with deadly venom. I really enjoyed getting lost in Ela’s world and especially loved the characters. Ela is not your typical main character. She doesn’t wield a sword (her staff is very cool, however) or is able to singlehandedly fight off armies of men. She is really just an ordinary girl who is chosen for an extraordinary purpose. I love Ela, she is brave, determined, completely trusts the Infinite and through Him, she does extraordinary things. I love that she is still human and works hard to keep her snark in check. Even though every prophet from Parne has died young, Ela still marches courageously into every situation not knowing if she will survive it. The other characters are very well written as well and I loved the sweet romance between Ela and Kien. I cannot wait for the next book in the series, Judge, to see where this romance goes. 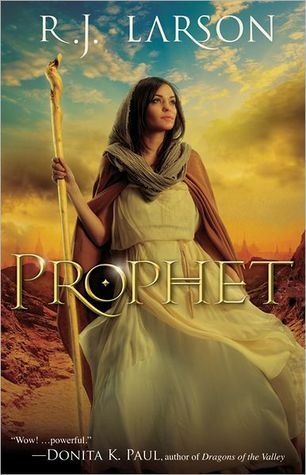 Prophet is an exciting and sweeping novel that I highly recommend for fantasy lovers everywhere, teens and adults alike. Judge comes out in November and it’s definitely on my must read list for the end of the year. On a side note, the cover of Prophet is perfect! It looks exactly like how Ela is described in the book. Oooh, this sounds really good. I've never heard of it, but I'd definitely pick it up and read it. I love crossover Christian fiction too - it's much easier for me to read than 'regular' Christian fiction. Asheley, I totally agree that crossover Christian fiction is easier to read than 'regular' or as I like to call it, my mom's Christian fiction. Lately, I have really been enjoying Christian fantasy like this one and the Waterfall series by Lisa T. Bergren. So good!